LE VOLVO 70 PUMA, UNE DECORATION HYPERREALISTE ! La réalisation de la silhouette du Volvo 70 Mar Mostro m’a demandé plus de temps que je ne l’avais imaginé. Le décor des voiliers de course est devenu récemment un enjeu formidable pour les sponsors. Les artistes, publicitaires et chargés de communication rivalisent d’idées créatrices pour mettre en valeur l’image de la marque. Cette réalisation nous donne aussi l’occasion de revenir sur la Volvo Ocean Race 2011-2012, de publier l’ensemble des résultats, et de donner une fiche technique de ces voiliers. Leurs caractéristiques principales étant bloquée dans une “box-Rule“, seules les formes des coques et des ponts sont différentes, comme nous l’avons vu dans un précédent chapitre. Par rapport au plan de formes de Groupama (Juan Kouyoumdjian Design), le vainqueur, que nous avons publié, Puma possède à peu près la même coque, un peu plus profonde sur l’arrière. Sur le pont du félin, le roof en sifflet laisse davantage courir l’eau. 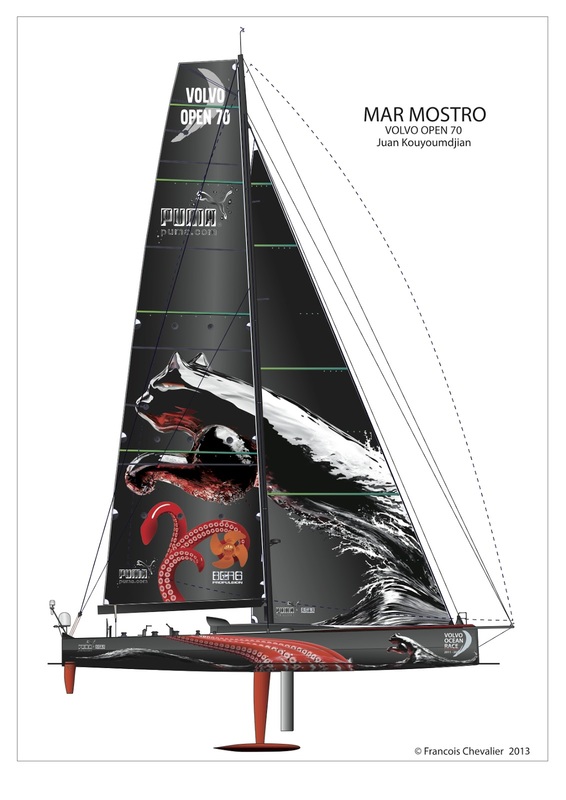 PUMA Ocean Racing powered by BERG were second, ahead of CAMPER with Emirates Team New Zealand in third. Team Sanya edged Groupama sailing team in the battle for fourth and fifth, with Team Telefónica trailing home. 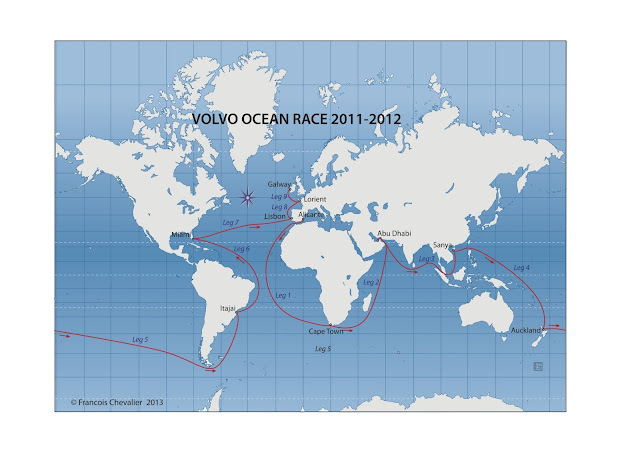 Abu Dhabi Ocean Racing retired from Leg 5 at 10:00 UTC 4 April due to hull damage. On April 10, Azzam departed on a ship from Puerto Montt, Chile to Itajaí. Team Sanya retired from Leg 5, returned to New Zealand, the yacht was then shipped to Savannah for repairs and sailed to Miami to rejoin the race. The wingsail of Oracle is a model of its kind: simplicity, soft forms, steerable trailing edge on the leading edge flap with a thick profile, more flexibility of the four vertical panels of the trailing edge flap with a thin profile. ETNZ one is in its pure form. A straight-line leading edge, two flexible flaps in plan; the leading edge element is thicker than the one of the trailing edge, which is vertically divided in four panels. The center of pressure is lower than the Oracle and Artemis wings, and a slight complementary surface on the lower flap. The entire system guarantees an amount of power, which was properly handled from the very first sea trials, the catamaran displaying a stable flight attitude on one foil. The first Artemis wing is more elaborate, with sinuous curves, divided in three elements. The first element is very large and shows a lenticular profile. The second and third flaps, with thinner profiles, are divided vertically into six panels; combined, the three elements resemble the wings of long-haul aircraft with flaps extended. The second Artemis wing is intended to support simplicity: it is divided in two elements, and it preserves curves on the leading and trailing edges. The first flap has a thick leading edge profile; the second one is very thin and can be moved from the first one. On the construction side we can see the same range of differences. 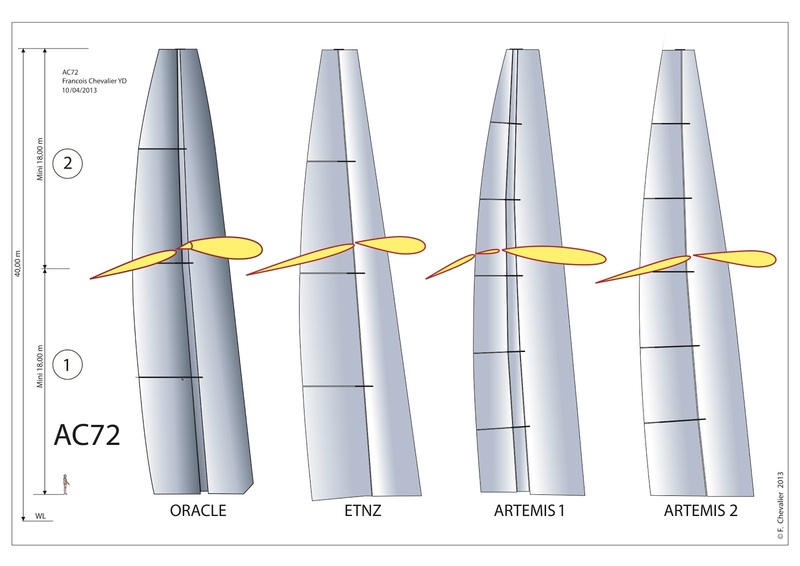 The frame structure of Oracle wing is 0.64 meter long (2’1’’); it is 0.78 m (2’6’’) long on ETNZ, 1.05 m (3’6’’) long on Artemis I and 1,20 m (4') on Artemis II. 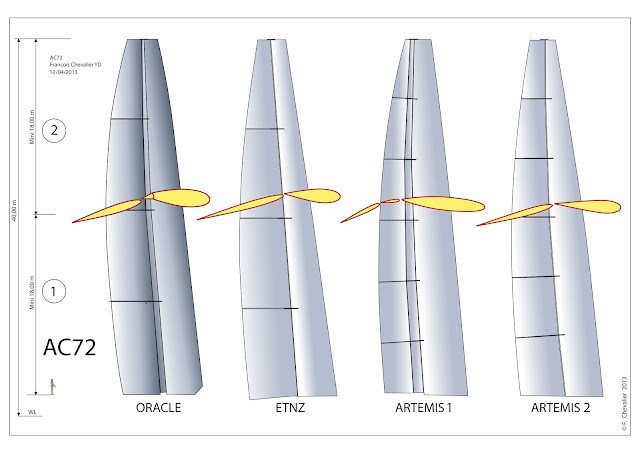 This analysis reflects that the power of the three wings is certainly not the same and each profile is quite unique at various points of sail. François and Jacques wish to thank Robert and Greg (CupInfo) for their assistance in the translation in English.